Die Jovis, 15 Februarii, 1648. Thanks to Sir A. Heslerigg. Counsel to Earl of Cambridge. ORDERED, That Sir Arthur Heslerigg have the Thanks of this House given him, for his many great and faithful Services done for the State, at Tynmouth, and in the North. And Sir Arthur Heslerigg being present in the House; Mr. Speaker did accordingly give him the Thanks of this House. Ordered, That Peter Keckwich Esquire be and is nominated and appointed High Sheriff of the County of Cornwall: And that the Lords Commissioners of the Great Seal of England do issue a Commission to him to be Sheriff of the said County accordingly. Ordered, That Robert Dockenfeild Esquire be and is nominated and appointed High Sheriff of the County of Chester: And that the Lords Commissioners of the Great Seal of England do issue a Commission to him to be Sheriff of the said County accordingly. Ordered, That Sir William Brewerton, Colonel Harrison, Colonel Purefoy, Lieutenant General Crumwell, Major General Skippon, Colonel Moore, or any Three of them, do consider of a fitting and convenient Place for a Gaol, for Keeping of the Prisoners of the said County; and also to consider, What Arrears are due unto Robert Dokenfeild Esquire; and how the said Arrears may be satisfied to him. * * * * (fn. 1). Mr. Miles Corbett reports a Form of a Commission of Oyer and Terminer, with divers Alterations and Omissions out of the former Commission: Which was read; and agreed to. Another Form of another Writ, de Si non omnes: Which was read; and agreed to. The like, for the Commission of Gaol Delivery: And on the Question, was assented unto. The like, for a Writ of Association: Which, upon the Question, was assented unto. Another form of a Writ, de Associatione: Which, on the Question, was assented unto. Another Form of a Writ of Assize. Ordered, That the Lords Commissioners for the Great Seal do pass the Commissions and Writs, according to these Forms. Mr. Serjeant Thorpe reports the Form of another Oath to be taken by every Sheriff, touching his making of an Accompt: Which was read; and some Alterations offered; and upon the Question, so amended, assented unto. Ordered, That all Sheriffs that have levied or received any Money by Process, out of the Exchequer, or otherwise, for the Use of the Commonwealth, shall forthwith pay it in to the Receipt of the Exchequer. An Act for the more easy passing the Accompts of Sheriffs was this Day read the First and Second Time; and, upon the Question, committed to Serjeant Thorpe, Mr. Robinson, Mr. Martyn; to withdraw, and bring in the same presently. YOU shall swear, That you shall be true and faithful to the Commonwealth of England; and that you shall well and truly execute the Office of Sheriff of the County of according to the best of your Skill, Power, and Knowledge, so long as you shall continue in that Office. So help you God. The Oath of a Justice of Peace. YOU shall swear, That you shall be true and faithful to the Commonwealth of England; and that you shall well and truly execute the Office of a Justice of Peace in the County of according to the best of your Skill, Power, and Knowledge, so long as you shall continue in that Office. So help you God. Ordered, That the Lords Commissioners of the Great Seal do pass Commissions to the several Judges of the Admiralty, under the Great Seal of England, accordingly. Ordered, That the High Sheriff of the County of Wiltes have Liberty, for a Month, to come to London, about his necessary Occasions. Ordered, That the Arms of the late King, over the Speaker's Chair, be forthwith taken down: And that the Serjeant at Arms attending this House do cause a Carpenter to take down the same accordingly. Ordered, That an Act be brought in for taking down the late King's Arms out of the several Courts in Westminster, and all other publick Places: And that the Arms of England be set up, in their stead, in the said several Places. Mr. Martyn is to bring in the said Act. 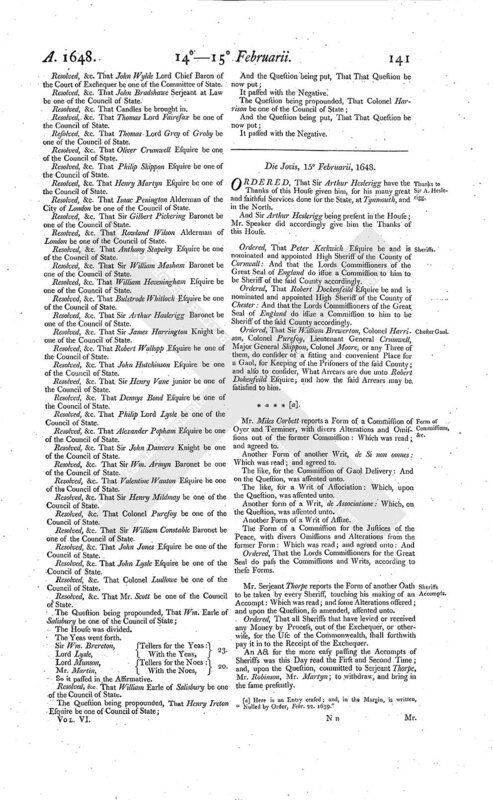 Mr. Garland reports Amendments to the Act for the Election of the Bailiff, Wardens, Assistants, and other Officers of the Commonalty of Weavers: Which, being read, were assented unto; and ordered to be ingrossed. Ordered, That the Lords Commissioners for the Great Seal be authorized and required to pass the Patent to the Cursitor Baron, under the Great Seal of England. He was called in: And Mr. Speaker demanded of him, What is become of the Return made by the Sheriff of the County of * of the Indentures for the Election of Sir Thomas Fairefax, and Colonel Rich, for the Town of Cirencester. The Clerk of the Crown made Answer, That it was delivered to the Committee of Privileges; and was never delivered back again to him, but is since imbeziled; and tendered an Affidavit touching the Matter of Fact. Ordered, That Mr. Allen, Mr. Serjeant Thorpe, Colonel Jones, Colonel Harrison, Sir Arthur Heslerigg, Mr. Love, Colonel Harvey, Colonel Masham, Mr. Miles Corbett, Mr. Carey, Mr. John Corbett, Mr. Dove, Mr. Anlaby, Sir Wm. Constable, Mr. Thomas Harrison, Mr. Holland, Mr. Trenchard, Mr. Robinson, Mr. Bond, or any Three of them, are to consider, What is fit to be done that the Gentlemen who are certified to be lawfully elected, may be admitted into the House; and to examine the Misdemeanor: With Power to send for Persons, Papers, Records, &c.; and to send for such Members of this House, and to examine them in this Business. And the Care hereof is commended to Colonel Harrison, and Mr. Allen. And this Committee is to meet To-morrow in the Afternoon, in the Queen's Court. Mr. Serjeant Thorpe reports Amendments to an Act for the more easy passing the Accompts of Sheriffs: Which Amendments were twice read; and assented unto: And the Act, with the said Amendments, being read the Third time, was, upon the Question, passed. Ordered, That this Act be forthwith printed and published. Ordered, That the Committee that is to bring in an Act for the Militia of Westminster, Southwarke, and the Hamlets, do meet de die in diem; and bring in . . . . . several Acts on Saturday next. 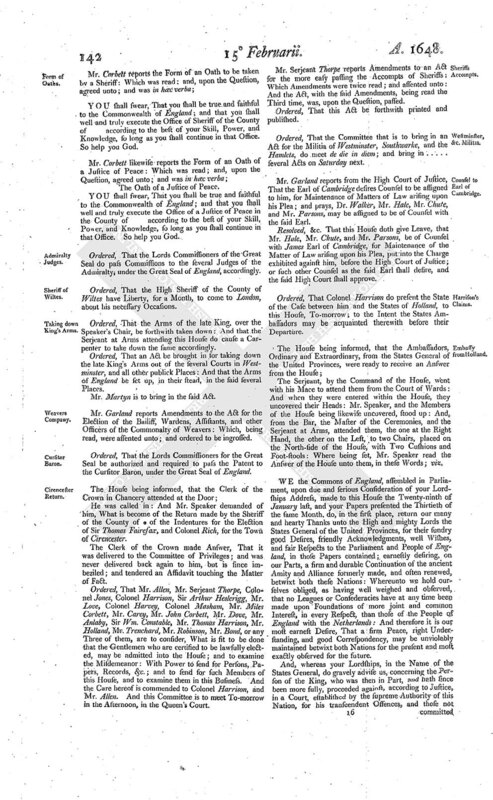 Mr. Garland reports from the High Court of Justice, That the Earl of Cambridge desires Counsel to be assigned to him, for Maintenance of Matters of Law arising upon his Plea; and prays, Dr. Walker, Mr. Hale, Mr. Chute, and Mr. Parsons, may be assigned to be of Counsel with the said Earl. Resolved, &c. That this House doth give Leave, that Mr. Hale, Mr. Chute, and Mr. Parsons, be of Counsel with James Earl of Cambridge, for Maintenance of the Matter of Law arising upon his Plea, put into the Charge exhibited against him, before the High Court of Justice; or such other Counsel as the said Earl shall desire, and the said High Court shall approve. Ordered, That Colonel Harrison do present the State of the Case between him and the States of Holland, to this House, To-morrow; to the Intent the States Ambassadors may be acquainted therewith before their Departure. The Serjeant, by the Command of the House, went with his Mace to attend them from the Court of Wards: And when they were entered within the House, they uncovered their Heads: Mr. Speaker, and the Members of the House being likewise uncovered, stood up: And, from the Bar, the Master of the Ceremonies, and the Serjeant at Arms, attended them, the one at the Right Hand, the other on the Left, to two Chairs, placed on the North-side of the House, with Two Cushions and Foot-stools: Where being set, Mr. Speaker read the Answer of the House unto them, in these Words; viz. WE the Commons of England, assembled in Parliament, upon due and serious Consideration of your Lordships Address, made to this House the Twenty-ninth of January last, and your Papers presented the Thirtieth of the same Month, do, in the first place, return our many and hearty Thanks unto the High and mighty Lords the States General of the United Provinces, for their sundry good Desires, friendly Acknowledgments, well Wishes, and fair Respects to the Parliament and People of England, in those Papers contained; earnestly desiring, on our Parts, a firm and durable Continuation of the ancient Amity and Alliance formerly made, and often renewed, betwixt both these Nations: Whereunto we hold ourselves obliged, as having well weighed and observed, that no Leagues or Consederacies have at any time been made upon Foundations of more joint and common Interest, in every Respect, than those of the People of England with the Netherlands: And therefore it is our most earnest Desire, That a firm Peace, right Understanding, and good Correspondency, may be unviolably maintained betwixt both Nations for the present and most exactly observed for the future. And, whereas your Lordships, in the Name of the States General, do gravely advise us, concerning the Person of the King, who was then in Part, and hath since been more fully, proceeded against, according to Justice, in a Court, established by the supreme Authority of this Nation, for his transcendent Offences, and those not mitted in a Corner: We are confident, that both the High and Mighty Lords the States General of the United Provinces, and all other States and Princes, who have taken notice of our late Affairs, will find Cause to believe, that nothing hath been done therein, but what is agreeable to publick Justice, and the Fundamentals of this Nation: Which certainly must needs be better known to us, than to any other People or Nation in the World. And we shall desire your Lordships would from us assure the High and Mighty Lords the States General, that we shall be ever ready, not only to hear, but to contribute with them, all good Means and Offices, to fulfil such Works as shall be necessary for the general Good of Christendom, as well as for our own. Which being read, the Lord Paw rose up; and uncovering his Head, and making a low Obeisance, declared the Ambassador's good Resentment of the Parliament's Answer, and Respects unto them: And, after he had ended, the Lord Joachimi likewise. And the Lord Joachimi presented to the House several Petitions: The one intituled, The humble Petition of Peter Bowdeen Courteen, Peter Michaels, Giles Tison, and Company of Merchants of Middlebourgh and Flushen, Owners of the Ship Concord of Flushing, whereof Peter Eling is Master. The other was intituled, The humble Petition of Peter Burgaine against Solomon Smith Esquire. The Petition of Peter Bowdeen Courteene, Peter Michaels, Giles Tison, and Company, Merchants of Middleborough and Flushen, Owners of the Ship Concord, whereof Peter Eling is Master, presented to the House by the Lords Ambassadors from the States General of the United Provinces, was this Day read. Ordered, That the said Petition be referred to the Consideration of the . . . . . Navy; to examine the Truth of the Matter; and to determine and end it, as they shall think fit; or report to the House. 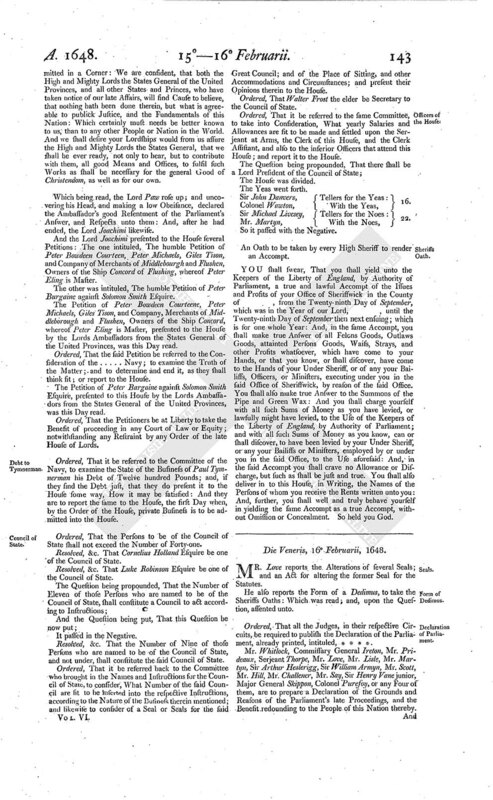 The Petition of Peter Bargaine against Solomon Smith Esquire, presented to this House by the Lords Ambassadors from the States General of the United Provinces, was this Day read. Ordered, That the Petitioners be at Liberty to take the Benefit of proceeding in any Court of Law or Equity; notwithstanding any Restraint by any Order of the late House of Lords. Ordered, That it be referred to the Committee of the Navy, to examine the State of the Business of Paul Tymnerman his Debt of Twelve hundred Pounds; and, if they find the Debt just, that they do present it to the House some way, How it may be satisfied: And they are to report the same to the House, the first Day when, by the Order of the House, private Business is to be admitted into the House. Ordered, That the Persons to be of the Council of State shall not exceed the Number of Forty-one. Resolved, &c. That Cornelius Holland Esquire be one of the Council of State. Resolved, &c. That Luke Robinson Esquire be one of the Council of State. It passed in the Negative. Resolved, &c. That the Number of Nine of those Persons who are named to be of the Council of State, and not under, shall constitute the said Council of State. Ordered, That it be referred back to the Committee who brought in the Names and Instructions for the Council of State, to consider, What Number of the said Council are fit to be inserted into the respective Instructions, according to the Nature of the Business therein mentioned; and likewise to consider of a Seal or Seals for the said Great Council; and of the Place of Sitting, and other Accommodations and Circumstances; and present their Opinions therein to the House. Ordered, That Walter Frost the elder be Secretary to the Council of State. Ordered, That it be referred to the same Committee, to take into Consideration, What yearly Salaries and Allowances are fit to be made and settled upon the Serjeant at Arms, the Clerk of this House, and the Clerk Assistant, and also to the inferior Officers that attend this House; and report it to the House. Sir John Danvers, Tellers for the Yeas: 16. Sir Michael Livesey, Tellers for the Noes: 22. An Oath to be taken by every High Sheriff to render an Accompt. YOU shall swear, That you shall yield unto the Keepers of the Liberty of England, by Authority of Parliament, a true and lawful Accompt of the Issues and Profits of your Office of Sheriffwick in the County of, from the Twenty-ninth Day of September, which was in the Year of our Lord, until the Twenty-ninth Day of September then next ensuing; which is for one whole Year: And, in the same Accompt, you shall make true Answer of all Felons Goods, Outlaws Goods, attainted Persons Goods, Waifs, Strays, and other Profits whatsoever, which have come to your Hands, or that you know, or shall discover, have come to the Hands of your Under Sheriff, or of any your Bailiffs, Officers, or Ministers, executing under you in the said Office of Sheriffwick, by reason of the said Office. You shall also make true Answer to the Summons of the Pipe and Green Wax: And you shall charge yourself with all such Sums of Money as you have levied, or lawfully might have levied, to the Use of the Keepers of the Liberty of England, by Authority of Parliament; and with all such Sums of Money as you know, can or shall discover, to have been levied by your Under Sheriss, or any your Bailiffs or Ministers, employed by or under you in the said Office, to the Use aforesaid: And, in the said Accompt you shall crave no Allowance or Discharge, but such as shall be just and true. You shall also deliver in to this House, in Writing, the Names of the Persons of whom you receive the Rents written unto you: And, further, you shall well and truly behave yourself in yielding the same Accompt as a true Accompt, without Omission or Concealment. So held you God. 1. Here is an Entry erased; and, in the Margin, is written, "Nulled by Order, Febr. 22. 1659."